Nickols Manor: Look Out! Zombies! 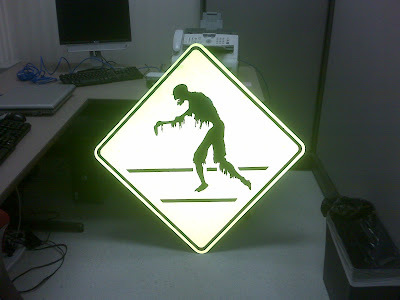 The Brandywine Cemetery haunt in Ann Arbor, Michigan photoshopped a zombie sign years ago for their haunt. I've always loved the sign. They had the original file in the gallery on their site that I've been hanging on to for sometime now. 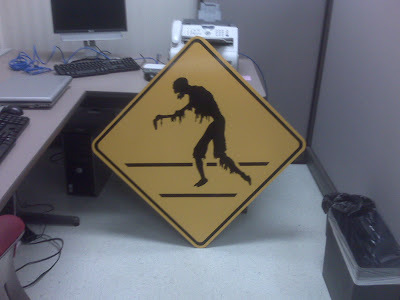 Well, I work for a municipality and helped the guys in the Sign Shop with their new cutter and software. In return for my help, they made me a sign!!! I can not tell you how excited I am right now!! It's a thing of beauty! that is freakin' sweeeeet! you lucky ghoul!! i'd never heard of bradywine til now. i've not lived here in MI very long. i cant wait to go!!!!!!!!!!!!!!! Thanks Diane! We are located in a suburb northeast of Dallas, Tx. Brandywine has some amazing items. You definitely need to check out his haunt! This is Robert. I created the sign and run Brandywine Cemetery. The Sign is public domain. Feel free to download it and use it for your haunt. I ran out of time to produce a video. Didn't say that last year?